Owerriâ€” The latest news in Imo State is that the state House of Assembly has approved Governor Rochas Okorochaâ€™s request for his son in-law, Uche Nwosu, to succeed him in office in 2019. Nwosu is currently the Chief of Staff to Okorocha. This is coming on the heels of the hullabaloo over Okorochaâ€™s appointment of his younger sister, Mrs. Ogechi Ololo, as the commissioner for the newly created Ministry for Happiness and Purpose Fulfilment in the state. Before her appointment as commissioner, Ololo had served as the Chief of Staff, Domestic Affairs in Okorochaâ€™s cabinetÂ apart from beingÂ in charge of the Christmas Decoration Project, since the inception of Okorochaâ€™s administration about seven years ago. Also, another of his sons-in-inlaw, Uzoma Awuka, is also an important personality in Okorochaâ€™s government. Uzoma is the son of the current Minister of State for Education, Prof. Anthony Awuka. Chief Okorocha was the first governor to create the office of Chief of Staff, Domestic Affairs, since the creation of Imo State on February 3, 1976. Ohorochaâ€™s wife and deputy Chief Executive Officer, CEO, of the state, Nkechi also supervises five other ministries and departments. According to a statement by the Secretary to Imo State Government, Mr George Etche, on December 15, 2016, the key ministries include the Ministries of Works, Health, Women Affairs and the Office of the Secretary to the Imo State Government as well as the state Amnesty Committee which was announced on September 26, 2016.Â The Amnesty Committee has the mandate of ensuring the welfare of those who denounced militancy in the oil-bearing areas of the state. All the appointments were greeted with loud protests which were largely ignored by the governor, just as questions had always been raised about the modalities used in allocating funds for the projects handled by the governorâ€™s sister as no official figures were mentioned for such â€œspecial projects,â€� including the Christmas Decoration Project. Those who spoke to South-East Voice in Owerri lamented the situation whereby Okorocha was running key ministries with his brothers and sisters as if the state was his private estate. The former Deputy Speaker of the House of Representatives, Chief Emeka Ihedioha, who spoke on the situation said: â€œHonestly, I am completely tired of talking about this man and his style of administration. You can be sure that before we finish talking about the creation of Ministry of Happiness, he will come with a more bizarre thing. Also, commenting on the issue, the immediate past governor of Imo State, Chief Ikedi Ohakim said: â€œThis is a sort of abomination. How can this man continue to insult the sensibilities of Imo citizens? â€œWhose happiness are they looking for when salaries and pensions are not paid? Are we looking for the happiness of the Okorocha family and friends? â€œI have not heard about such a ministry anywhere in the world before. It is not in Britain that gave us independence. It is not in the United States of America whose democratic system we copied. It is not in Canada. It is nowhere in West Africa. Â Also, the former commissioner for Information, under Chief Okorocha, Mr. Vitalis Ajumbe said: â€œThe governor has a right to do anything he likes in the process of governance. For him to have appointed a commissioner in charge of Happiness, that means Imo people are not happy. Somebody should be there to make Imo people happy. In his comments over the issue, the State Organizing Secretary of Labour Party, LP, Mr. Igboayaka. O. Igboayaka said: â€œLet me start with this, the person the governor appointed as Commissioner for Happiness is his sister. She is also the Deputy Chief of Staff, Domestic Affairs. â€œThis is the high level of mediocrity and nepotism. Okorochaâ€™s government does not consider expertise in governance. If you look at his commissioners, they are the same. â€œWhat Imo people are currently facing is the inability of the government to pay workers and pensioners. This is what we call administrative prodigality. In the same vein, the Director- General, New Media, Imo State chapter of the Peoples Democratic Party, PDP, Mr. Aic Akwarandu, said: â€œI have always believed that nothing about Okorocha interests me. I wish I can stop talking about him but it is not possible. â€œWe all know that whoever the gods want to destroy, they would first make mad. He will continue to make mistakes to the detriment of the people who are at the receiving end, but these things are temporary. Everything that has a beginning has an end. â€œHow can a governor create 27 ministries and a Ministry of Happiness and Purpose Fulfilment in a state where pensioners are being owed their entitlements in this period of recession? This is the height of insanity. All those who spoke found objectionable, the seeming plan by Okorocha to turn government into a family affair. But reacting to the barrage of criticisms, Okorocha said, â€œAt the end of the day, the achievements of the new Ministry of Happiness and Purpose Fulfilment,Â Â will be so amazing that the critics of the initiative, will not only be shocked but will also regret to have drawn the curtain for the new Ministry even before it took off. â€œIdeas are like bullets. They pierce greatly. And Rochas Okorocha is a man of tremendous ideas who thinks about the present and the generations yet unborn. â€œHe does not misfire on any issue, the attendant criticisms notwithstanding. When the new ministry begins to bear the expected fruits, the accolades will envelop the early criticisms. â€œSome people have also talked about Jacob Zumaâ€™s statue as a referenced case. The criticisms that greeted Zumaâ€™s statue were all anchored on the corruption allegations against the South African president. â€œYet, the fact remains that the man is still the president of that country. He has neither been sentenced to imprisonment nor impeached as president following these corruption claims. 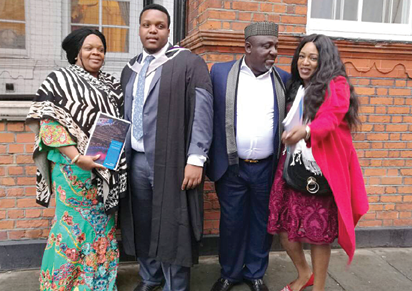 The post Happiness Ministry: How Okorocha and his family run Imo State appeared first on Vanguard News. Next articleStruggling to Find Inspiration on LinkedIn? Look Again! Canon Collins Thekgo (Undergraduate & Postgraduate) Bursary 2019 for Study in South Africa.